With the ski season at an end and the snow beginning to melt it can only mean one thing, summer; and this summer in particular a little event called the World Cup. 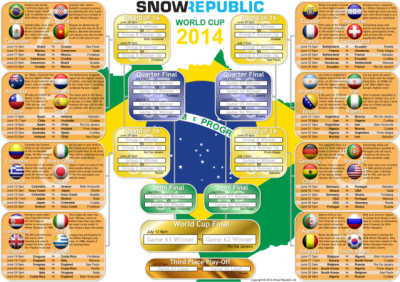 Well to help you get through both the guys at Snow Republic have created a free World Cup wall chart with a difference. Instead of the usual football text we have fun snow sport trivia for all the countries taking part, with some surprising results. It may lead you to look at some countries you never thought of visiting before for your next ski or snowboard holiday. Either way you can watch the games and still get your snow fix. Love it or hate it, you won’t be able to escape it! Click here to download it now, it’s FREE.